Scanitto Lite is a lite and powerful software for image scanning from TWAIN scanners. 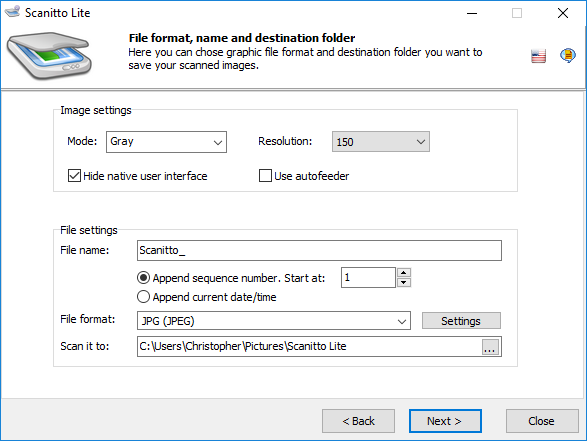 Scanitto Lite allows you scan images, save scanned images to various formats (bmp, jpeg, tiff, png, pdf, gif), output images directly to the printer (make a copy) and manage scanned images. Cumbersome, bloated and unfriendly user interface. Inability to save images in a format that is useful for your needs. Inability to directly copy the image onto your printer. Using Scanitto Lite you can easily and simply scan images, documents or photos, and save them in a format which is necessary for you. Also Scanitto Lite gives you the flexibility of direct-printing on your printer, allowing use of your printer and scanner as a copy machine. Scanitto Lite is simple to use, all that you need is: choose a scanner, setup a scanning settings and a folder for saving scanned images. After scanning you can directly print your images. The opportunity of saving images in follow formats: bmp, jpeg, tiff, png, pdf, gif. Setup of resolution and color depth of images.